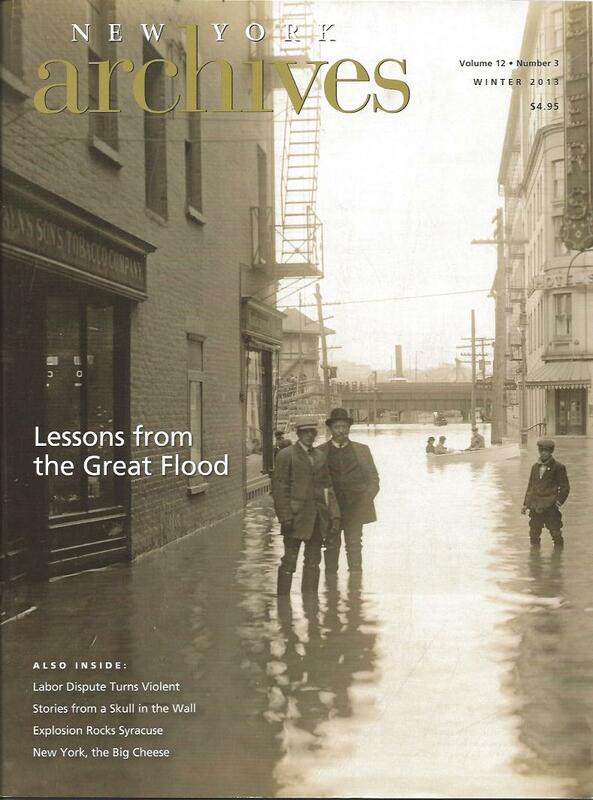 Book, research blog, and articles: Click on images below for PDFs of print articles as well as info about my book on the 1913 flood in Dayton. 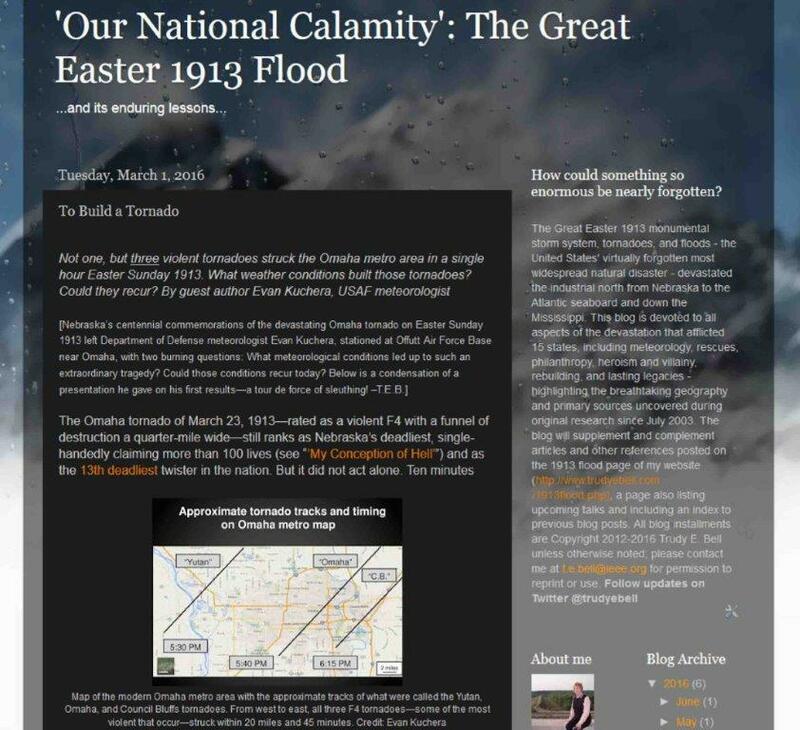 Much additional analytical research by guest authors as well as myself is also published online through "'Our National Calamity;' The Great Easter 1913 Flood," whose 60+ installments since late 2012 total text now approach the length of a book, complete with extensive documentation (nearly 150,000 views as of November 1, 2017). Searchable table of contents to the research blog can be downloaded from the top link at the far left column on this page. Media appearances and talks: Interviewed on camera for the following TV documentaries: When Every River Turned Against Us: Lessons from the Great 1913 Flood (WFYI PBS TV, Indianapolis; Producer: Gary Harrison--see full 30-minute film and 3-minute trailer; film captured a 2014 regional Emmy Award for a documentary!). Also have given numeroous invited and keynote talks at historical, flood-control, and water-resources conferences in half a dozen states. Was also interviewed for The 1913 Flood: Shadow Over the Miami Valley (Producer: Sam Ashworth). Interviewed for Channel 5 WEWS News, Cleveland--especially note the additional full-length 7-minute interview. Featured guest along with Cleveland National Weather Service senior hydrologist Sarah Jamison on 55-minute NPR live call-in show The Sound of Ideas, Cleveland, WCPN 90.3 FM, March 27, 2013--podcast and studio video are here. 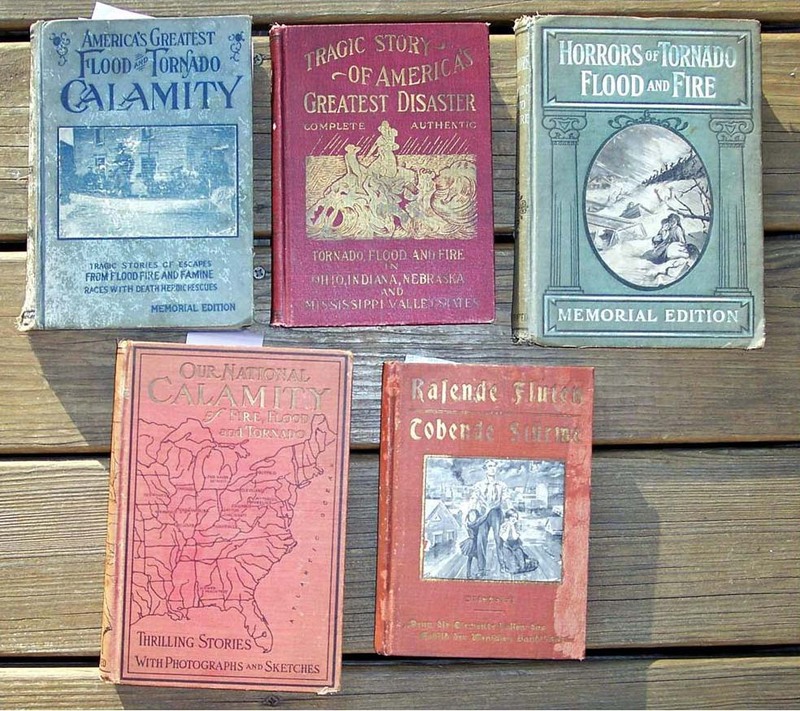 Right: Five of the "instant books" that were published within two months of the tornadoes and floods in 1913. Books in the research collection of Trudy E. Bell. In July 2003, a chance reading of historical markers on a bicycle trip sent me on what has become a major, systematic historical detective search to uncover the full story of this national calamity, which made front-page headlines worldwide and generated at least five "instant books" and innumerable commemoratives (see "Profiting from Pain"). 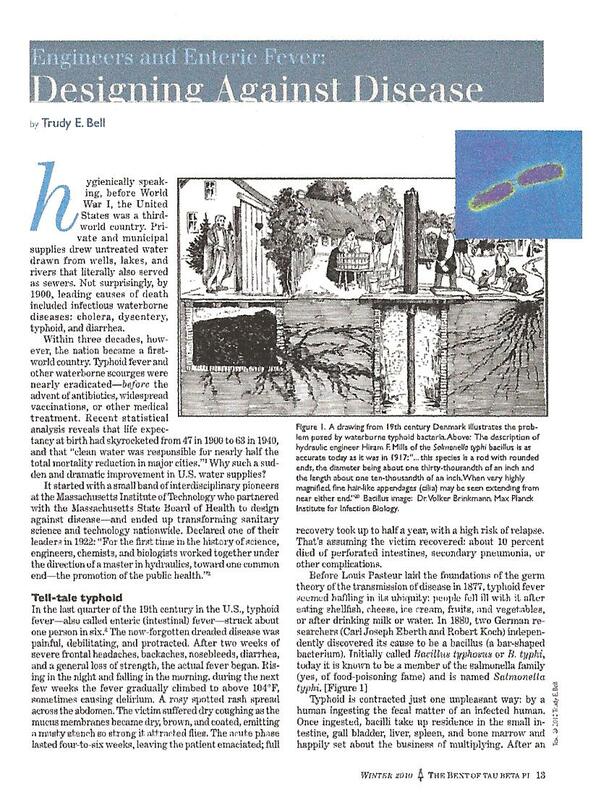 I also wanted to find out how and why - despite being more fatal than the 1871 Chicago fire, more devastating to property than the 1906 San Francisco earthquake (to which disasters it was often compared at the time) or even than Hurricanes Katrina (2005) and Sandy (2012), and the nation's only natural catastrophe to disrupt communications and manufacturing across the industrial north as well as down the Mississippi River throughout the agricultural south - the national disaster has been virtually forgotten. Fascinated that something so huge [see U.S. map above] could now be so unknown, over the past 12+ years I've researched newspapers on microfilm, official government reports, photographs, and correspondence in the National Archives, state historical archives, and special collections of major public libraries - crisscrossing the nation from as far west as Topeka and Omaha, to as far east as Boston, New York City, and Washington, D. C., and points south all along the Mississippi River to New Orleans. So far, I've published one book and half a dozen print articles, and delivered research papers and keynote addresses at several dozen hydrology and history conferences (those since 2012 are listed below). In 2009, I was a Filson Fellow for a week of research in residence at the Filson Historical Society in Louisville, Kentucky. My ultimate goal is to write the definitive book on the Great Easter national calamity of 1913 and its consequences. 2018. Gave invited talk "'Deity and Disaster': From the Great Easter 1913 Food to Hurricanes Harvey, Irma, and Maria," Messiah Lutheran Church, March 11, comparing the theological responses to the horrific disasters in both 1913 and 2017. Expansion of the presentation is here. 2017. Gave two invited talks at the 2017 Indiana Water Resources Association annual symposium, Turkey Run State Park, Marshall, IN, the main one on the 1913 flood (June 28) and a research presentation on high hazard dams (June 30). 2015. 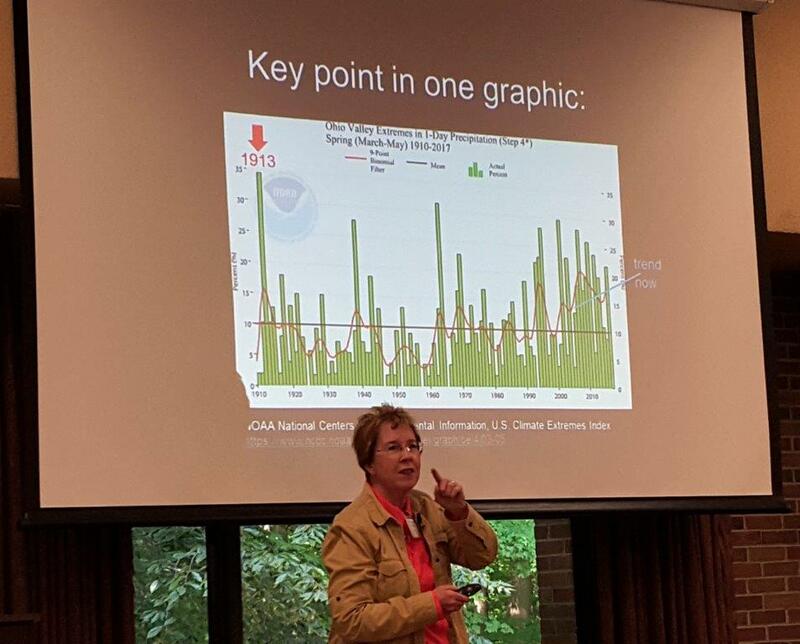 Lead speaker at a special session on the 1913 flood, 2015 National Hydrologic Warning Council Training Conference & Exposition, Indianapolis, IN June 15-18. Presentation is here. 2015. Invited speaker, Greater Cincinnati Crisis Communication Workshop, Erlanger, KY, "Handling a Crisis When Communications are Devastated" May 28. Slides from four of the six presentations can be downloaded from this GC3W page (scroll down; mine is the top presentation below the intro image). 2014. 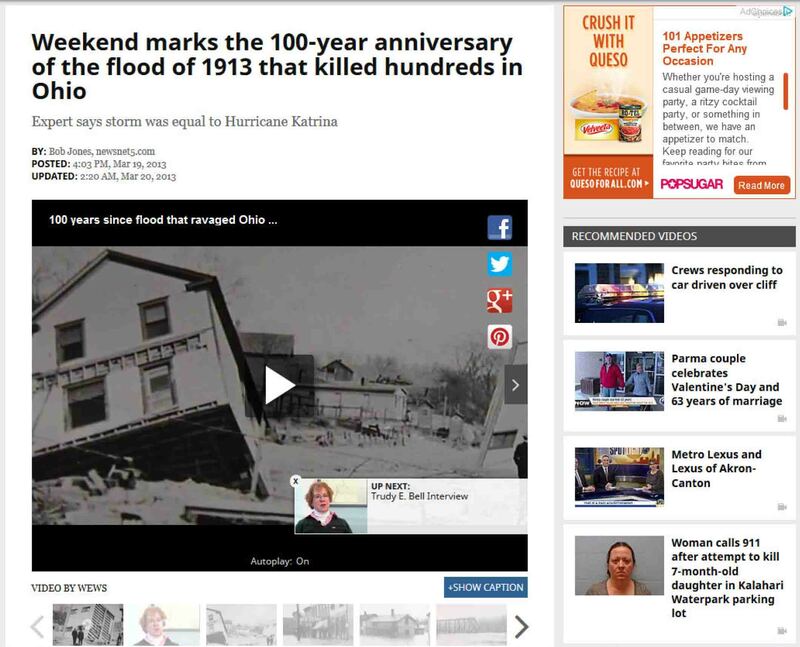 Speaker, Huron Public library, Huron, Ohio, "Ohio's 'Katrina': The Great Easter 1913 Flood," October 21. 2014. Speaker, Omaha-Offutt Chapter of the American Meteorological Society and National Weather Association, Omaha, Nebraska, "1913's 'Katrina': The Great Easter 1913 Tornadoes and 15-State Flood," September 24. 2014. Keynote Speaker, Annual Meeting, Society for the Preservation and Use of Resources (SPUR), Richmond, Indiana. 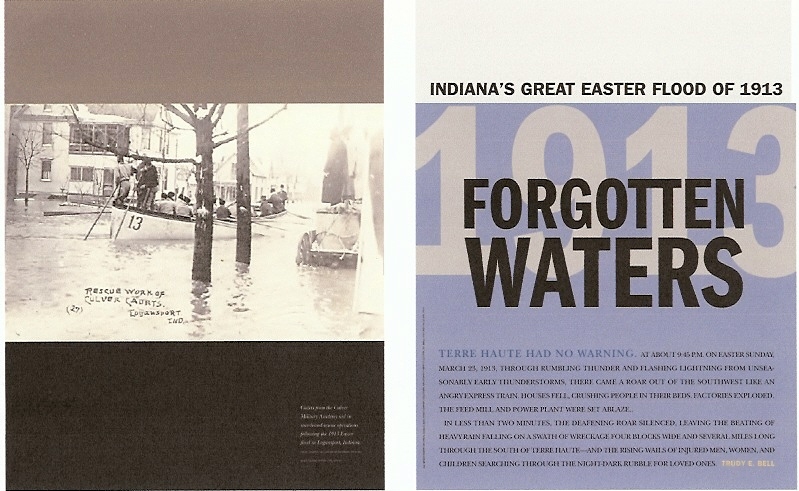 "Indiana's 'Katrina': The Great Easter 1913 Flood." May 20. 2014. Speaker, Carnegie Mellon University, Department of Engineering and Public Policy, Center for Climate and Energy Decision Making, on "Extreme Weather and Today's Engineered Infrastructure: Lessons from the 1913 Flood," April 22. 2014. Panelist with Emmy Award-winning filmmaker Gary Harrison, moderated by Manuela Johnson (State Disaster Relief Fund, Indiana Department of Homeland Security); conference "Operation Stay Afloat 2014," Indianapolis, IN, March 13. 2013. Panelist along with Scott Morlock (Deputy Director, U.S. Geological Survey Indiana Water Science), John Hill (Executive Director, Indiana Department of Homeland Security), and Siavash Beik (Principal Engineer, Christopher B. Burke Engineering, LLC), moderated by Steve Bray (News Director and Chief Meteorologist, WISH-YV); Indiana Historical Society, Indianapolis, after premier screening of WFYI documentary When Every River Turned Against Us, directed by Emmy Award-Winning filmmaker Gary Harrison, November 8. 2013. Guest speaker, "Ohio's 'Katrina': The Great Easter 1913 Flood," Lakewood Historical Society and Lakewood Public Library; at Main Auditorium, Lakewood Public Library, Ohio, October 2. 2013. Keynote speaker, "Indiana's 'Katrina': The Great Easter 1913 Flood," 2013 Annual Conference, Indiana Association for Floodplain and Stormwater Management (INAFSM), September 11. Speaker presentations; my slides are here. 2013. Guest speaker, "The Great Easter 1913 Tornadoes and Flood: How Rotary Discovered its Humanitarian Mission," Santa Cruz Rotary Club, August 23. 2013. Guest speaker, "The Great Easter 1913 Tornadoes and Flood: How Rotary Discovered its Humanitarian Mission," Watsonville Rotary Club, California, July 17. 2013. Guest speaker, "The Great Easter 1913 Tornadoes and Flood: How Rotary Discovered its Humanitarian Mission," Lakewood-Rocky River Sunrise Rotary Club, Don Umerley Civic Center, 21016 Hilliard Blvd., Rocky River, OH, April 24. 2013. 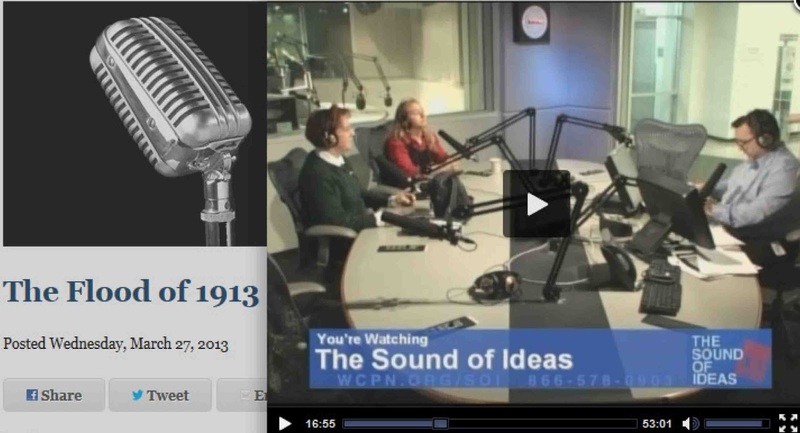 Guest with Sarah Jamison (hydrologist, National Weather Center, Cleveland) on 1-hour call-in show devoted to "The Flood of 1913" on "The Sound of Ideas" (WCPN 89.3 FM radio; televised WVIZ Channel 25 Ohio channel), March 27. Audio podcast and televised studio appearance available. 2013. Lyceum Lecturer at Cuyahoga Valley National Park (Happy Days Lodge, Peninsula, OH), speaking to sell-out crowd of 280 on "The Great Easter 1913 Flood: Ohio's Worst Natural Disaster--and Cleveland as First Responder," March 22. 2013. One of three featured guests (the other two were Eloise Batic and Angele Giacomelli of the Indiana Historical Society) discussing "Flood of 1913, Worst in State History," on the one-hour radio show "Hoosier History Live!" hosted by Nelson Price, WICR 88.7 FM, Indianapolis, IN, March 9. 2013. "Ohio's Greatest Disaster: The 1913 Flood in Hamilton and Beyond," sponsored by the Michael J. Colligan History Project, Parrish Auditorium, Harry T. Wilks Conference Center, Miami University Hamilton, Hamilton, OH, March 5. Video of my talk is about a quarter of the way down this page on the Colligan site (search for my name); the video was shot in several segments. 2013. 70th Annual Meeting of the Ohio Federation of Soil and Water Conservation Districts (OFSWCD); (theme: "70 Years of Conservation: Events That Shaped Our Future"), Columbus Renaissance Hotel, Columbus, OH, February 25. 2012. 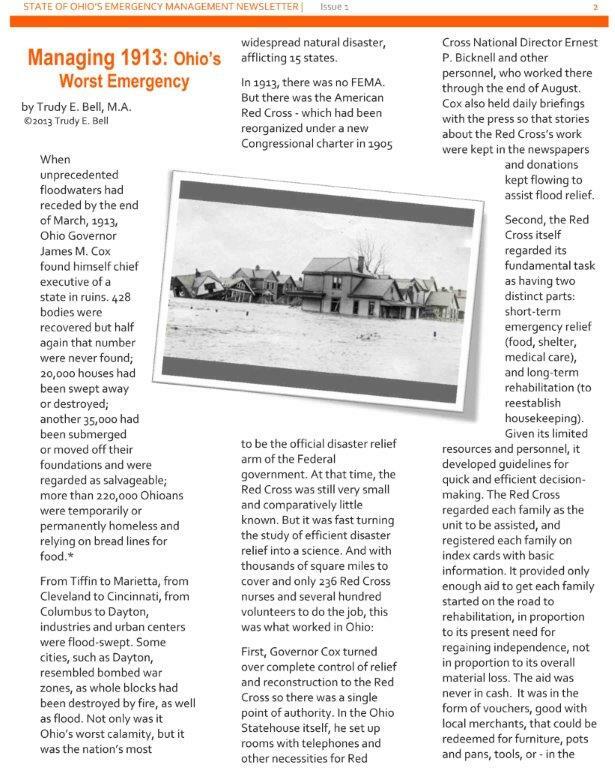 "Remembering and Forgetting 'Our National Calamity': Legacy from the Great Easter 1913 Flood," at the fall conference of the Water Management Association of Ohio (theme: "100 Years of Watershed Events"), Quest Conference Center, Columbus, OH, November 14. 2012. "Ohio's Greatest Disaster: The 1913 Flood in Warren County and Beyond," at the Franklin Area Historical Society symposium "Preserving the Memories of the 1913 Flood," Franklin Public Library, Franklin, OH, March 30. Events in 2013 are listed on the FAHS website. 2009. 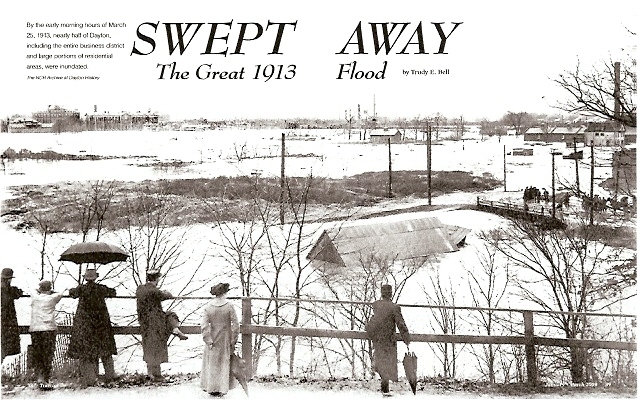 "The Great Easter 1913 'Midwest' Flood in New York State." Conference on New York State History, State University of New York, Plattsburgh, New York, June. Paper presents original research about effects of the 1913 flood across New York State, including record flooding of the Hudson River that knocked out the Albany water treatment plant, and the subsequent movement to regulate flood heights of the Hudson. Includes one graph. 2009. “Aid and Ambivalence: Contradictory Responses of Victims Toward Disaster Relief During the Great Easter 1913 Tornadoes and Flood,” U.S. Senator Rush D. Holt History Conference (theme: “Worlds Turned Upside Down: Crisis, Calamity, and Cataclysm), West Virginia University, Morgantown, West Virginia, April. Paper explores how some individuals and towns refused disaster relief aid - even though they may have been rendered physically destitute by the disaster - in order to preserve personal or cultural values about not being seen as paupers (i.e., the "undeserving" poor). Slides also appear here. 2007. “The Devastating Nebraska–Iowa–Kansas–Missouri Tornadoes of Easter 1913,” Missouri Valley History Conference, Omaha, Nebraska, March. Paper presents original research and analysis documenting that there were more tornadoes over a wider area in the Easter 1913 supercell outbreak than is generally recognized, and that their paths of destruction were longer. Slides, which include new maps, appear here. 2006. 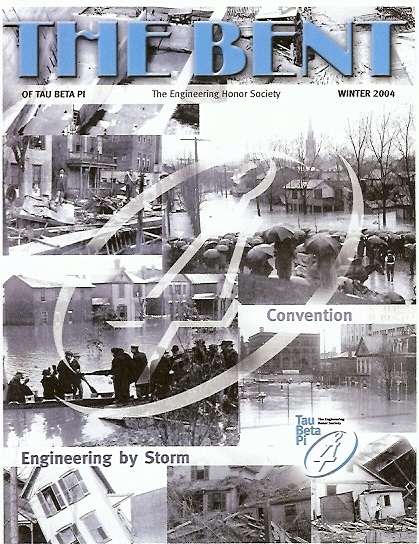 “Recovering From the Great Easter Flood of 1913,” at a special conference called "After Katrina," Louisiana State University, Baton Rouge, Louisiana, June. Talk, not written out in a detailed draft, compared different Federal and local responses in 1913 vs. 2005; the principal difference was that in 1913 individuals were encouraged to return as soon as possible to clean and rebuild. 2006. 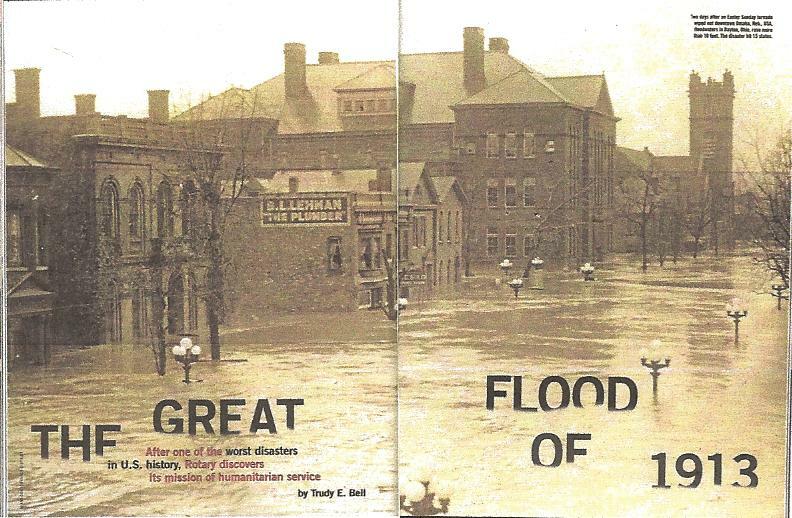 “The Great Easter Flood of 1913: The United States’ Forgotten Most Widespread Natural Disaster,” special featured speaker, Missouri Valley History Conference in Omaha, Nebraska, February. General introduction because the disaster was news to many of the historians, including the conference organizer, who asked if I would turn my paper from a regular talk into an evening presentation. Talk was not written out in a detailed draft; much of the paper's information appears as background in the other papers and articles.